This month we were asked to create something for square one art using the theme of water. Square one art is an annual fundraiser to create an art project that prints onto mugs, key rings etc. Since it rains a lot here, I decided it would be apt to create a rain themed project. For square one, I always try to make something that is unique to each child and that parents will think is cute enough to persuade them to place an order. 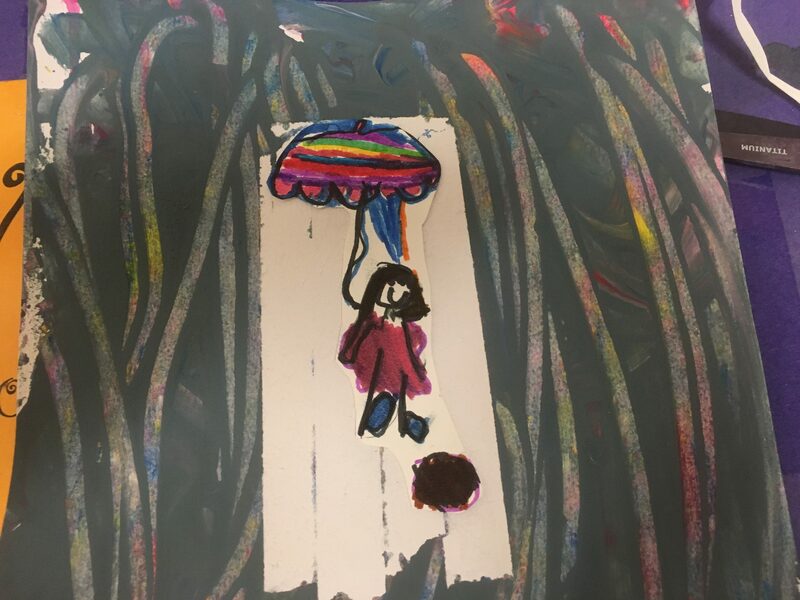 With this is mind, I decided to ask the children to draw a picture of themselves under an umbrella. The rain would be painted on top of the picture but the area under the umbrella would remain without any rain by marking it off with masking tape. 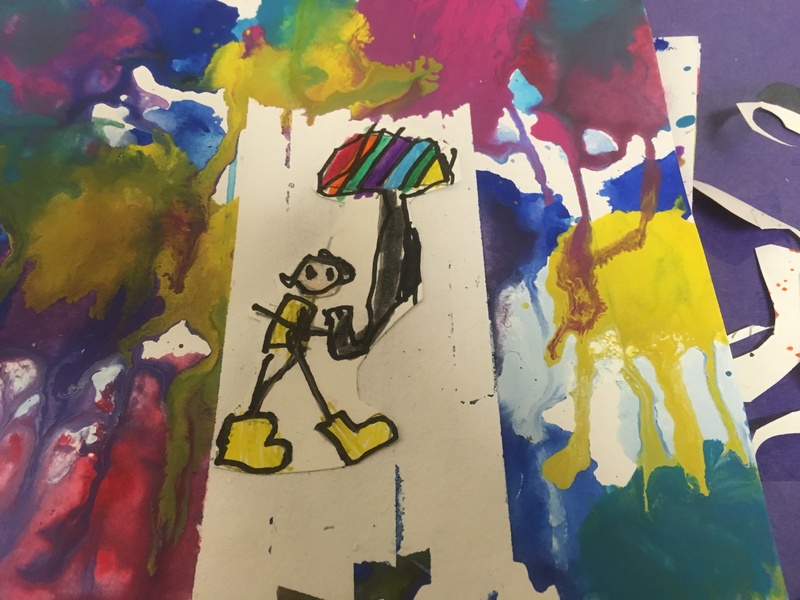 I collected images of rain paintings to show the children different ways of painting rain. Some showed rain dripping, others had splashes or fine sprays and some just had a mix of crazy colours in streaks. I started the lesson by showing the children pictures of rain paintings. We talked about some of the techniques and I demonstrated how to make paint drip down the page using a paintbrush and using a pipette/dropper. I also showed them how to flick the paintbrush to make a fine mist that looked like a rain shower. The children went away to practice. They tested different ways to make the paint drip. Some made their paintbrush really wet and then dipped it into the palate. Some painted a splodge of colour at the top of their paper and then used the dropper to add water to make it drip. Some found it worked well if they painted splodges all over the paper and then added water with the dropper. Some used a combination of techniques. and some did completely their own thing. When I came to do the project with 2nd Grade, we didn’t have practice time. I decided to water down the tempura paint in advance and give each table pots to share. 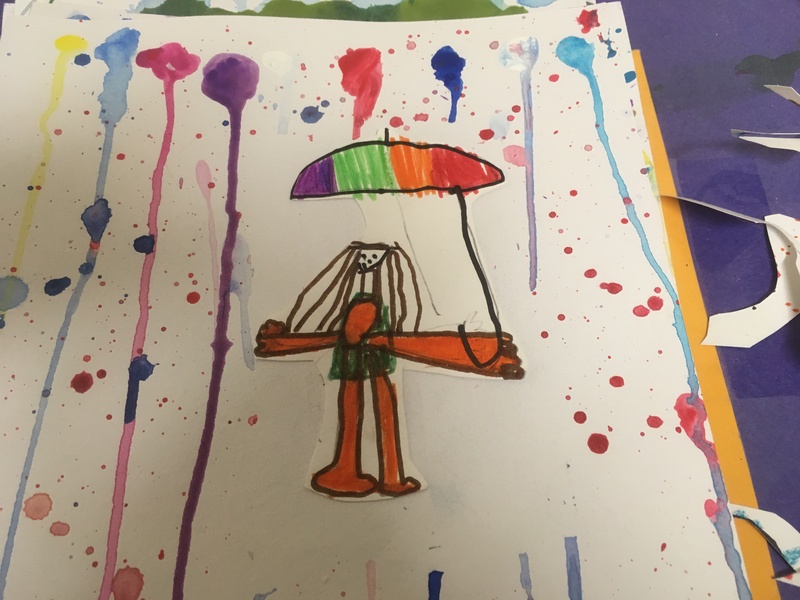 The 2nd graders started by drawing a picture of themselves under an umbrella. I marked out a border so that the drawings wouldn’t be chopped off. I think with hindsight I would also have drawn a square within which the children should fit their pictures as some of them were a bit small. We then taped over the pictures with masking tape and then dripped and splattered paint to make rain. The 2nd graders loved the drippy part as much as the kindergartners and some were a little over zealous. The next day when I came back to remove the tape from the dry paintings some of them needed to be fixed because the colours from their drawings had bled. Some I was able to fix myself by re-colouring them but some needed to be painted over with white acrylic and the children coloured them in again or in some instances re-drew the whole picture. The kindergartners had already drawn their pictures on a small piece of paper. When I prepared their project, I decided to measure the pictures and then place masking tape over an area of the same size. We could then create the rain picture, remove the masking tape when dry and stick on the picture, hopefully avoiding any colour bleeding. 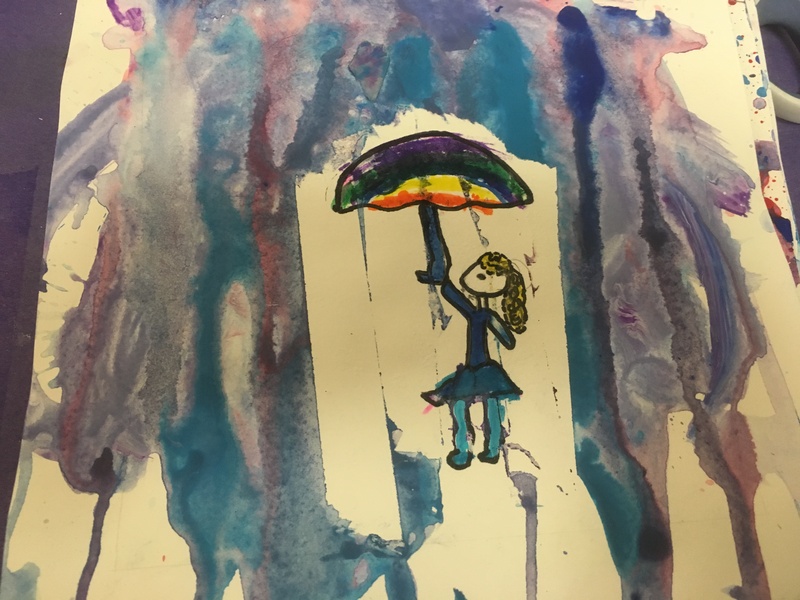 I showed the kindergartners some of the 2nd grade pictures to show how they had chosen to paint rain and how they might be improved. We saw that the paintings needed to have paint all around the masking tape for them to clearly show them sheltering under the umbrella. We also discovered that too much paint sometimes didn’t leave a perfectly clear area; although in some cases this left an interesting effect, like rain dripping from the umbrella. I watered down the paints and showed the children how to put the paint at the top of the paper and let it drip. It was important that they made their brushes really wet before dipping them in the paint as this helped it to drip. Having experimented with painting rain beforehand, the children had clear ideas of how they would like their rain to look. I added a yellow paint to the kindergartners colour choices, the 2nd graders had shades of red, blue and purple. Some children mixed a green shade. I love this one. It looks like a big gloomy rain cloud above his head. others spread paint along the top and let it drip. Others used a lot of water to make softer colours and spread them with the brush, creating the effect of rain blowing. One child wanted to spread paint all over the picture and made the rain by running her finger through it to make lines. The kindergarten pictures were much brighter than the 2nd grade ones. My personal favourite is this one. I love the big splashes of colour in a heavy downpour, in contrast to the person walking in safety under his umbrella. The colour choices, use of droppers and the volumes of paint make the 2nd grade pictures darker and more intense like that of a grey, winters day with heavy rain. The Kindergartners are more akin to spring showers. Perhaps a cool project would be to test out different techniques and colours to make a display of rain through the seasons. I’m always frustrated by the infrequency of my art sessions. I can already see the progression and probing questions that might make this into an extended project. How does the use of different colours change the way we see the rain? What colours would you choose for winter rain, tropical rain or a spring rain shower? Test out your ideas. Does the texture of the paint and how much water we add change the type of rain we paint? How does the size of the brush alter the painting. Try other ways of painting rain, use sponges, droppers/pippettes, cotton balls and what else can you suggest. Make a giant collaborative painting of rain – what can you drop onto paper to make a splash? How can we paint a heavy rainstorm? What would happen if we tried a different type of paint? Do you like rain? What colours would you use to show that you didn’t like rain? What colours would you use to show rain is fun? Think about all the different types of rain you have in your area, are they the same or different? How would you paint each type to show the differences? 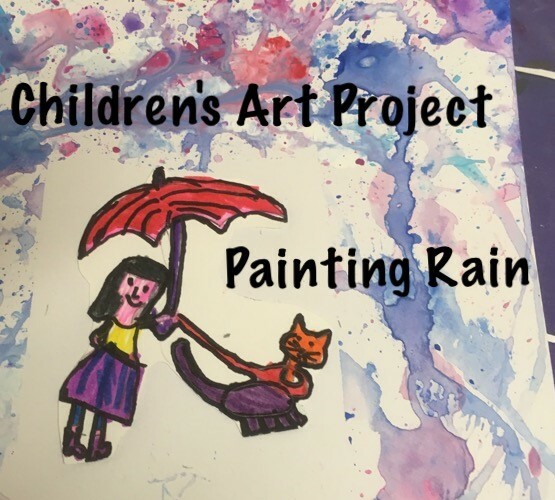 Make a list of rain adjectives or similes under the title ‘Rain is'(particularly after spending time in the rain) – choose one and paint a picture to illustrate the description. Look in a large puddle. What do you see? Can you try to draw/paint it? And that’s just the art – the possibilities for other areas of learning is endless. Perhaps you’d like to use my pictures as a springboard for an extended rain project? I’d love to see the results if you do. Previous PostHow to Survive a Road Trip from Seattle to Yellowstone with Three Kids, a Dog and a Tent.Next PostHow to Stop Using Pre-planned Topics and Plan from Children’s Interests.